Skip the conference room and take a field trip! Hold your next company meeting away from the office. You will find that it will create energy among your staff, promote camaraderie, and offer an environment to more creatively “think outside the box”. An offsite meeting is an opportunity to generate new ideas, build enthusiasm, and reaffirm commitment to the ultimate goals of the company. The following are some helpful tips to consider when planning an offsite meeting. Choose a location that fosters creativity– pick a physical location for the meeting that is exciting but has a relaxed atmosphere. Preview the facility– check out the facility to be sure that it will meet your needs and make your employees feel comfortable. Remember the budget –many venues have a package cost that takes into consideration the cost of the venue along with meals and/or refreshments. These types of venues tend to be the most cost effective. 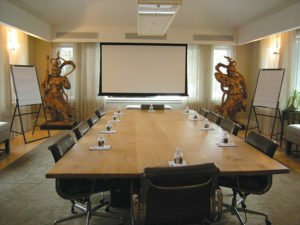 Transportation if necessary and perhaps a guest presenter are other costs to consider when planning an offsite meeting. Give two options for a meeting date – everyone has busy schedules and project deadlines, so give a choice of two dates for the meeting to be held. Plan to accomplish more– too often meeting planners plan for minimal results. With a solid strategy, the offsite meeting can accomplish much more. In addition to building a more cohesive team, it can be an opportunity to discuss new ideas, resolve business challenges, and provide your employees with skill development. Business time, fun time – build some fun group activities into your schedule. A team exercise at the beginning of your meeting can set a relaxing tone for the accomplishment of your planned goals. Small details add up to big success – an offsite meeting requires a bit more detailed planning than staying “home” at the office. Plan backwards from the date of the meeting to be sure every detail is covered. Smart scheduling is important– When planning your schedule, there are a few important things to take into consideration. Be sure to allow time for your attendees to get to the venue on time. Think about the distance and mode of transportation they will need. Also what type of environment do you want to create. Is your meeting an intense all work event, time to relax or a little of both? Promote your meeting in advance – when you have your meeting agenda complete, be sure your attendees receive a copy well in advance of the meeting date. This will let them know what your objectives are, give the attendees time to prepare any resources they may need, and complete any pre-meeting assignments you may choose to give. It also helps to generate some excitement about the offsite meeting. Following these guidelines for an offsite meeting can result in higher than average goal accomplishment and have your attendees talking about the best meeting they have ever attended!